Falling under the automotive segment, Mahindra small commercial vehicles in India are sold through the dealership network of passenger and utility vehicles segment. As against Tata Motors’ presence in different sub-segments of small commercial vehicles, Mahindra’s strength and stronghold is exactly opposite – Mahindra pickups are the market leader while Mahindra mini trucks are struggling to establish its mark. It would not be wrong to say that Mahindra Pickups have been the leader for years together, as far as Pickup trucks in India is concerned. Mahindra Bolero Pickup has been single handedly driving the segment of pickup trucks in India. Initially introduced in India as Mahindra Pik Up, later on upgraded to Mahindra Maxx Pik Up, today the vehicle available in market is called Mahindra Bolero Pik Up. Owing to its rugged body structure, lower maintenance need and high overloading capability, Mahindra Bolero Pickups have been winning the hearts of every Indian. 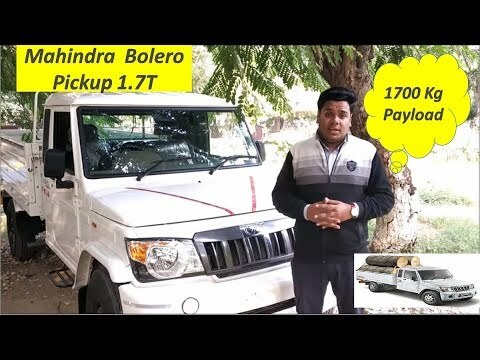 The recent introduction of Mahindra Maha Bolero pickup (Bolero Pik Up Extra Long) with highest ever 1700 Kg payload takes the supremacy of Mahindra pickup trucks a step further. Mahindra Bolero Pickup price in India starts from 6.41 Lakhs for Extra Strong 1.3 Ton base variant and from 6.66 Lakhs onwards for Extra Long 1.7 Ton base variant. In the segment lower, Mahindra Bolero Maxi truck was introduced to cater to lesser payload demanding customers. Recently, the vehicle got upgraded to Mahindra Bolero Maxi Truck Plus (BMT Plus) with minor upgrades, some new features and offers a class leading mileage of 17.7 Kmpl. Mahindra Bolero Maxi Truck price begins from 5.67 Lakhs onwards for base diesel variant. Mahindra Bolero Camper is a lifestyle pickup truck with a crew cabin. Mahindra Bolero Camper price starts from 7.13 Lakhs onwards and goes up for higher variants. And a top of the line Mahindra Imperio was introduced by automotive division to cater to premium end of pickup segment but did not get much market attention from the buyers out there. As far as the best mini trucks in India are concerned, Mahindra mini trucks range is swiftly moving forward to establish its mark in this segment. The company marked its entry into the segment years back with its Mahindra Maxximo, which eventually got upgraded to Mahindra Maxximo Plus. Currently at the entry level, Mahindra mini trucks portfolio has Mahindra Jeeto, offering around 600-700 Kg payload and available in wide range of deck length options, engine and payload options to choose from. At a slightly higher payload node, Mahindra Supro mini truck does the duty with its 850 Kg payload & powered by 26 HP engine. A node above is followed by Mahindra Supro Maxi truck with almost 1000 Kg payload and a powerful 45 HP engine. The fuel smart technology enabled engines ensure Mahindra Supro mileage to be the best in class. Recently, the company has replaced the front independent suspension in both Mahindra Supro mini truck as well as Supro Maxi truck with leaf springs. The new models with front rigid suspension are called as Mahindra Supro mini truck HD Series & Mahindra Supro Maxi truck HD Series respectively. Mahindra Maxximo price is not relevant today as the vehicle has been discontinued, while Mahindra Supro mini truck price for base model has been kept at 4.32 Lakhs (ex-showroom) onwards and Mahindra Supro maxi truck price has been kept at 4.82 Lakhs (ex-showroom) onwards for base variant. And for the smallest one, Mahindra Jeeto price for base S6 11 BS4 variant has been kept at 2.89 Lakhs (ex-showroom). To get the complete Mahindra Jeeto mini truck price list or on road price, do submit your request for us to get back to you. Moving from cargo trucks space to passenger vans segment, Mahindra Jeeto passenger variant is christened as Mahindra Jeeto Minivan and is quite popular in last mile connectivity space for carrying 3-4 passengers. Mahindra Supro mini van and Mahindra Supro van caters to people mover category with seating capacity of up to 8 passengers. It is to be noted that Mahindra Supro passenger van is the only vehicle in its category offering an AC version for cooler rides in high temperatures. Mahindra Jeeto passenger van price starts from 3.45 Lakhs while Mahindra Supro Mini Van price starts from 4.91 Lakhs and Mahindra Supro Van price starts from 5.16 Lakhs onwards (ex-showroom for base model).